Sarath Kumar has been confirmed to race for Monlau Competicion in the 2013 Spanish Moto 3 Championship. This was announced today at the glitzy launch of sports management firm SK-Sarath69, which is promoted by renowned South Indian actor and politician, R Sarath Kumar. SK-Sarath69 Sports Pvt. Ltd has been launched with the aim of helping and promoting young sportspersons in India. Young rider Sarath Kumar, who is the only Indian to have competed at the pinnacle of two wheeler racing events, MotoGP, will race in an international series for the third consecutive year. While he made his MotoGP 125cc class debut in 2011, he participated in the Italian Championship 125GP Class in 2012 with a podium finish at the historic Monza circuit. The Spanish Moto 3 Championship has been the stepping stone for many current MotoGP riders, including Jorge Lorenzo, Dani Pedrosa, Casey Stoner and Marc Marquez. Last year Monlau Competicion won the Spanish Moto 3 Championship with Alex Marquez, younger brother of MotoGP rider Marc Marquez. Sarath will be riding the Suter-Honda Moto3, which is a 250cc 4-stroke prototype race bike developed for the Moto3 world championship. This prototype is powered by a Honda engine. Starting with the 2012 season, the Moto3-class replaced the 125-cc 2-stroke class in FIM premier championship of motorcycle road racing which existed since 1949. 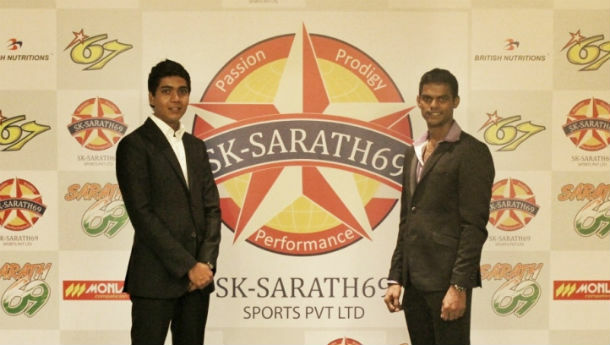 SK-Sarath69 was founded with the intention of promoting and nurturing promising talent from India to prepare them for the rigors of international competition. The company will focus on talent from all sporting disciplines with the first project focusing on motorsports. R Sarath Kumar, Chairman, SK-Sarath69, is a strong believer in promoting the youth of the country and is thrilled to be a part of this initiative. He commented, 'India, as a sporting nation is at a very nascent stage, and the youth will play an integral role in taking it to the next level. While there is no dearth of talent in India, it is important that these young sportsmen are developed and groomed the right way. Our goal is to prepare young sportspersons to compete on an international scale, with the right training, financial backing and guidance. We are proud to announce young rider S. Sarath Kumar as our first signing and even more excited to confirm his participation in the Spanish Moto 3 Championship with Monlau Competicion. Sarath is supremely talented and we need to give him the best possible opportunity to win races. We are also happy to work with Rajini Krishnan, who recently made history by becoming the first Indian rider to win an international motorcycle event. With Sarath and Rajini we have the two best Indian riders and we intend to help them get to the top step of the podium.' added R. Sarath Kumar.